Friday, March 4 from 5:30 p.m. – 7:00 p.m. – Invitation only VIP Cocktail Reception for Olympians, Sponsors and Special Guests. Adults only. Saturday, March 5 from 9:00 a.m. – 4:00 p.m. – Olympian & Elite Track & Field Academy just for kids! Youth ages 9 – 16 will work directly with our Track & Field luminaries in a morning Clinic learning techniques to improve performance. They can then put what they learned to the test in our (optional) practice meet following the clinic. As you know, this is a very unique and special opportunity taking place right here in Ventura County! We know some clubs have a practice meet planned for that Saturday. If your club does not, we hope you’ll consider coming out and participating in our event! Please help us spread the word by forwarding this email to your club members or mentioning the event on your team’s website. High school track programs in your community are also welcome to participate. The VIP reception on Friday is invite only. Tickets are available at OjaiRoadrunners.BPT.me. 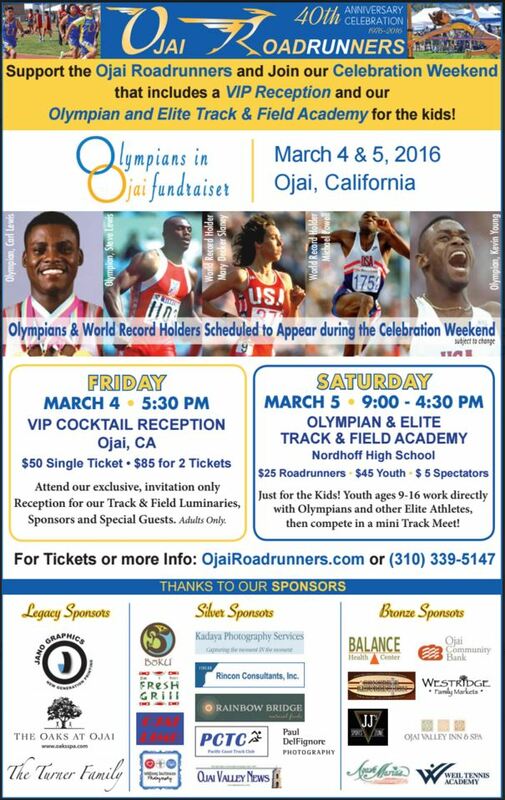 Those wishing to attend should email Info@OjaiRoadrunners.com for a passcode needed to purchase tickets. See attached flyer or OjaiRoadrunners.com for more information.